The Slope Farming Project, Arba Minch, Ethiopia, by the Hamburg University of Technologies, Germany, is intended to facilitate both practical and theoretical research on the new, interdisciplinary field of "Restoration Engineering" within the broad field of "Rural Developement". Therefore a holistic approach regarding the restoration of degraded soils and ecosystems is developed and will be set into practice for the first time for evaluation, practical research, benchmark testing, system improval and demonstration purpose, finally. To combat the deterioration of arable land by soil erosion and degradation, caused by non-adapted conventional agricultural practice and the destruction of natural vegetation, a new land use management system is highly needed, which takes the topics of water and wastewater, soil and vegetation management, agriculture, energy systems, drought stress related to a changing climate, food and water insecurity, malnutrition and poverty and migration processes into account and solves them togehter, in one co-operative, synergistic, low-cost, sustainable approach. The water availability for domestic and agricultural use can be increased by adapted measures of Rain Water Harvesting, in off-site in the gullies and on-site at the fields. Aquifers can be recharged by increased retention and infiltration of Rain Water - which then can be used also in dry seasons. 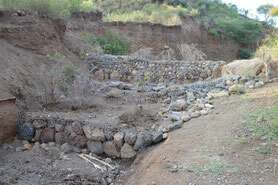 Additional, soil erosion can be drastically reduced. A highly fertile, humus-rich compost can be processed by lactofermentation and vermicoposting from human excreta known as Terra Preta. Nutrients and organic matter can be recycled, benefitting the long-term soil fertiltiy. Additionally, Terra Preta Sanitation systems can substanitally improve the sanitary conditions in developing countries. 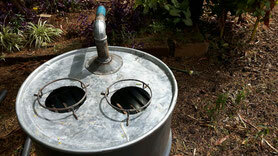 Wood Gas Stoves produce charcoal with the process of pyrolysis while someone can cook his dinner. Not only is the efficiancy of the charcoal production much higher than with traditional kilns, also emission air is much cleaner. Less wood is needed for cooking and charcoal production. Therefore the pressure on forest areas due to wood logging can be drastically reduced. To restore degraded soils and ecosystems, a perennial, dense vegetation cover should be implemented to prevent erosion processes. Nitrogen fixing trees can increase soil fertility, nutrient- and structure-wise. 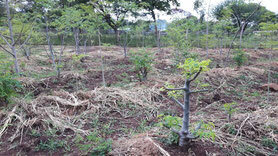 Deep rooting trees can loosen up compacted soils, increasing the water availabiltiy. Drought stress in the dry seasons can be minimized, also by a perennial canopy giving shade and windbreak to the ground. Arranged in an agroforestry system, trees (especially Moringa) become an important part of an holistic system, sequestering large amounts of carbon dioxide. Free grazing livestock can dramatically degrade soils and ecosystems. 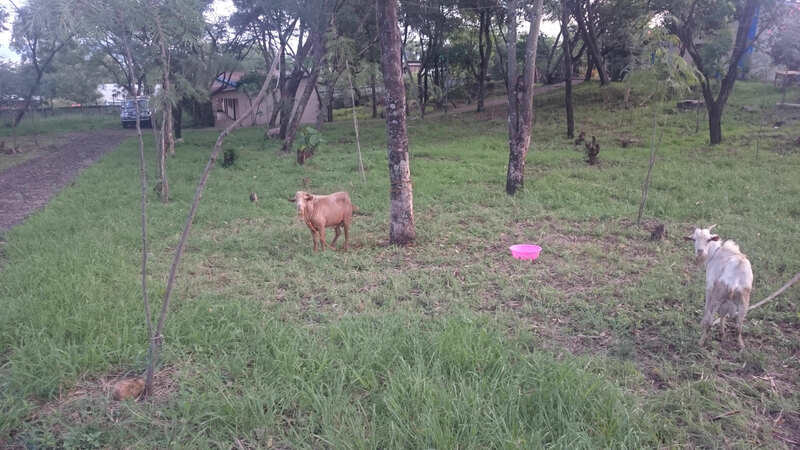 Nevertheless, when managed in an integrated system along with agroforestry, livestock production can be significant, while the ecosystem is not degraded, in fact, it can be restored. Nutrients are recycled on the spot, soil is enriched with organic matter. 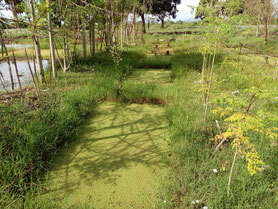 The soil comes back to life, humus can be produced, favoring the water availability and soil fertility. 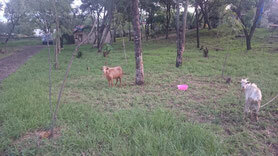 By a diverse diet, meat and milk production of livestock can be increased. For improved livelihood construction, a new approach of sustainable housing construction is implemented. 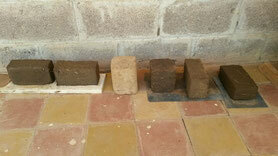 Using loam bricks, houses can be constructed in a low-cost, sufficient way. By the usage of local resources and manpower, local value can be created. Expensive, external resources can be substituted, while jobs can be generated, benefitting the local community. Productive Ponds can be used to produce fast-growing Azolla, a plant capable to fix tremendous amounts of nitrogen in a short periode of time. Only needed for this is some cow manure and soil. Ideally, another phosphorus source is added, like bone meal. It is thinkable to create a resource-oriented "waste and wastewater management system" around the ponds, cycling local nutrients to produce high-value organic fertilizer and livestock fodder.